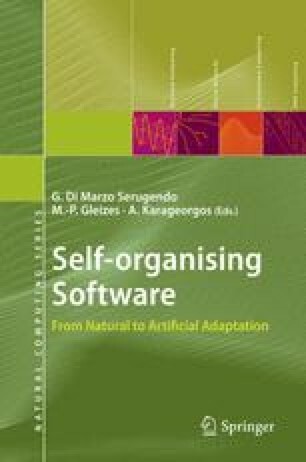 This chapter presents the application of the human immune system model and approach to the design of self-organising architectures for artificial systems. The human immune system is a decentralised intelligent system exhibiting remarkable capabilities for learning, information processing and adaptation to environmental changes. Furthermore, it provides an excellent model of adaptive operation at local level and emergent behaviour at global level. There exist several theories aiming to explain immunological phenomena occurring in the human immune system, and numerous software models suitable for their simulation. In this chapter, the idiotypic network model of Jerne is analysed aiming to identify the required elements for implementing it in an agent architecture. The resulting mechanism is illustrated in the collaborative decision-making process carried out by a multi-agent system used for robot soccer simulation. This chapter introduces an architecture for MAS which is based upon a specific interpretation of the human immune system.